NINGBO R.D.C OFFICE EQUIPMENT CO., LTD. Established in 1988 and with its further development and extending step by step, Ningbo Ronghua Office Equipmen t Co., Ltd. invested another 47,000 square meters in Yinzhou Investment & Innovation Center for setting up Ningbo Rongda Office Equipment Technology Co., Ltd. and Joint-ventured Inc.-Ningbo R.D.C. Office Equipment Co., Ltd.
invention of High-tech product—OME(optical-mechanical-electrical) digital duplicator through 3 years’ research, has set a new historical milestone for our fast developing. Fine and considerate after service makes our products sold well and unblocked in the markets. We have established hundreds of agents in many cities in China. In addition, in Japan, Australia, France, Singapore, HK, Thailand and Malaysia, we also achieve a great sell. 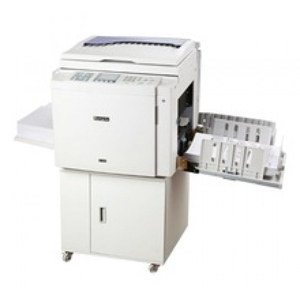 With high quality, fantastic and multi-function, our office equipments can be widely used in all government departments and corporations, especially suitable for social leagues and schools, who demand large printing quantity. "Young, Brave and Sapiential” Rongda people warmly like to strive and cooperate with friends in all fields to improve Chinese printing tech. to step into the whole world. Scan Resolution: 300x400 dpi Max. â˜† Sparkle: Secrecy system, operators can input a personal code, then the machine can’t be used without the code.